I started thinking about the work for this show nearly a year ago. I have focused on making and firing the work for the past six to eight months. The gallery was interested in having me generate pieces that address both utility and sculpture. This gave me the freedom to explore several ideas without sticking to a title or theme, for example, soda firing, wood firing, functional ceramics etc. My thinking was that after 30 years of working with clay my fingerprint would be recognizable in all of the work. I’m not certain that is always a good thing. I am a potter by heart; passionate about work that I can use each day and work that people will appreciate as part of their lives. 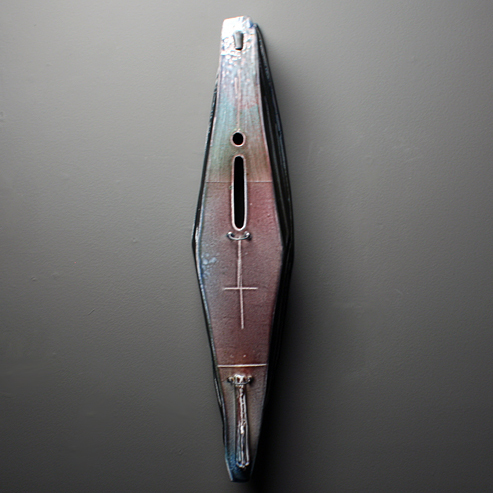 I am also interested in sculptural work, work that investigates ideas as conceptual questions. The work in this show is informed by pottery, landscape, architecture and a long list of artists, people and experiences I’ve had in my life.